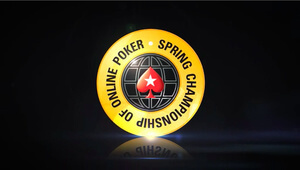 In the opening days of the 2013 PokerStars Spring Championship of Online Poker (SCOOP for short) tournament series it has been some of the biggest names in online poker who have been landing in the winner’s circle. With the series just days old, names like Sami Kelopuro, Paul Volpe, Ana Marquez, and Benny Spindler have already won SCOOP titles. And less than 10 events into the series Chris Moorman has already landed at two final tables while his fellow countryman Sam Grafton pocketed a $150k payday after a five-way chop in Event #8-H.
German poker pro Benny Spindler kicked-off the 2013 SCOOP series with a win in Event #1-H, a $2,100 NLHE 6-Max tournament that attracted a field of 848 players, generating a near-$1.7 million prize-pool. 432 players took to the PokerStars tables for Event #3-H, a 4530 NLHE+R 6-Max tournament. The final table boasted a pair of poker’s top talents in Sami Kelopuro and Chris Moorman, and despite Moorman’s superhuman online tournament record, this time it was Kelopuro who took the top honor, with Moorman finishing in 6th place. In the $2,100 Badugi tournament it was two of online poker’s all-time greats going head-to-head in the form of Paul Volpe and Shaun Deeb. In the end it would be Volpe who would deny Deeb an unprecedented 6th SCOOP title. In Event #5-H, a $1,050 NLHE Rebuy Turbo tournament it was Team PokerStars Pro Ana Marquez who bested the 437-player field to win the $250k first-place prize. With a $1,050 buy-in and a $1 million guarantee the field for Event #8-H reached 1,521 entrants, easily smashing the guarantee. With huge money on the line the final five players cut a deal that saw each of them pocket at least $144k, including Sam Grafton, who walked away with $153,251 for his 4th place showing.